The X-47B is a low observable relevant unmanned combat air system carrier (UCAS) being developed for the US Navy. Image courtesy of Northrop Grumman. The X-47B during the flight test at Edwards Air Force Base in California. Image courtesy of Northrop Grumman. The tailless UCAS is designed to serve the US Navy carriers at sea. Image courtesy of Northrop Grumman. The US Navy's X-47B unmanned aircraft during its maiden flight. Image courtesy of Northrop Grumman. Landing of the X-47B Unmanned Combat Air System at the Edwards AFB after flight tests. Image courtesy of Northrop Grumman. The X-47B is an unmanned combat air system carrier (UCAS) is being developed by Northrop Grumman for the US Navy (USN). The strike fighter size unmanned aircraft is currently in its demonstration phase. 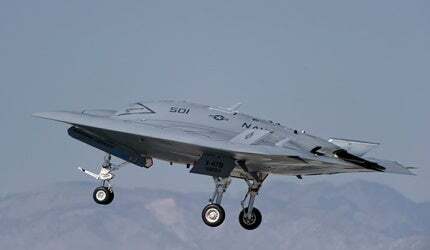 The unmanned aircraft was first developed as part of the X-47 programme. Air worthiness of the X-47B unmanned combat air system demonstrator was developed at an estimated cost of $813m. The aircraft performed a successful initial test flight at Patuxent River, Maryland, US, in July 2012. The X-47B is expected to enter active naval service by 2019. The X-47B UCAS was developed by the US Navy as part of the unmanned combat air system carrier demonstration (UCAS-D) programme. The programme aims to develop and demonstrate which fighter sized tailless unmanned aircraft can be deployed from US Navy aircraft carriers. The X-47B is a variant of Pegasus X-47A, which was developed as a joint USAF and USN programme, called J-UCAS, in 2001. The programme was funded by the DARPA with Northrop Grumman as the main contractor. In February 2006, however, the UCAS development programme was cancelled for separate UAV development programmes by both the defence forces. Development of the X-47B, which had started in June 2005, was temporarily halted following the cancellation. The US Naval Air Systems Command (NAVAIR) contracted Northrop Grumman for the construction and demonstration of two X-47B aircraft under the unmanned combat air system demonstrator (UCAS-D) programme, in August 2007. The UCAS-D programme also aims to pave the way for developing potential future carrier-compatible, unmanned systems with little risk. Companies collaborating on the UCAS-D programme include Rockwell Collins, Goodrich, Lockheed Martin, Parker Aerospace, Honeywell, GKN Aerospace, General Electric (GE), Wind River, Dell, Hamilton Sundstrand, Pratt & Whitney, Eaton and Moog. MQ-4C Triton is a new broad area maritime surveillance (BAMS) unmanned aircraft system (UAS) unveiled by Northrop Grumman for the US Navy. The tailless unmanned aircraft is 38.2ft-long and has a wingspan of 62.1ft. The shape of the aircraft is designed for stealth or low observable relevant requirements. The weapons bay can carry 4,500lb of weapons. Operations of the computer-controlled X-47B UCAS are smart and its flight control system is autonomous. The navigation of the UCAS is controlled by hybrid global positioning system (GPS) vision-based system. The flight path is preprogrammed and its operations are monitored by a mission operator. The UCAS is equipped with electro-optics (EO), infrared (IR), synthetic aperture radar (SAR), inverse SAR, ground moving target indicator (GMTI), electronic support measures (ESM) and maritime moving target indicator (MMTI) sensors. The UCAS-D will feature both probe-and-drogue of the US Navy and boom-receptacle mechanisms of the USAF for autonomous air refuelling. The X-47B is powered by a Pratt & Whitney F100-PW-220U engine and exhaust system. The aircraft has a high subsonic speed of approximately 0.45M and range of roughly 2,100nm. The UCAS can fly to a maximum altitude of 40,000ft. Two autonomous jet-powered X-47B aircraft were built under the UCAS-D programme. The two demonstration vehicles have similar design and hardware features. However, only one is equipped to test aerial refuelling tasks. They can accommodate various kinds of sensors for reconnaissance, intelligence and surveillance and have space for weapon systems. Payload is not installed on the demonstration units. The first X-47B, including structural proof testing, was completed by October 2009. Named air vehicle 1 (AV-1), the aircraft was transferred to Edwards Air Force Base (AFB) for flight testing in July 2010. The second aircraft, named AV-2, arrived at the base for testing in March 2011. The first flight test of the UCAS-D was conducted in February 2011. The first catapult launch of X-47B was conducted at an onshore catapult facility at Naval Air Station Patuxent River in November 2012. The first at-sea test phase involving a series of deck handling trials aboard the USS Harry S. Truman (CVN 75) was completed in December 2012. The aircraft will also be tested for launching, operating and recovering capabilities in a navy carrier operable area of 50nm. The carrier launch, recovery, and deck handling tests were completed in December 2012. The aerial refuelling demonstrations were carried out in April 2015.